Best Wishes for a HAPPY NEW YEAR!!! A Pair of Champions - British White Steer and His Showman! September 2012 - Both of these boys are champions. . . .
We all learned recently that the BWCAA board voted to award a monetary premium to kids who show British White animals and win champion in their class. I have to say I find it a bit of an underwhelming and an ineffectual token effort at supporting or promoting the breed. 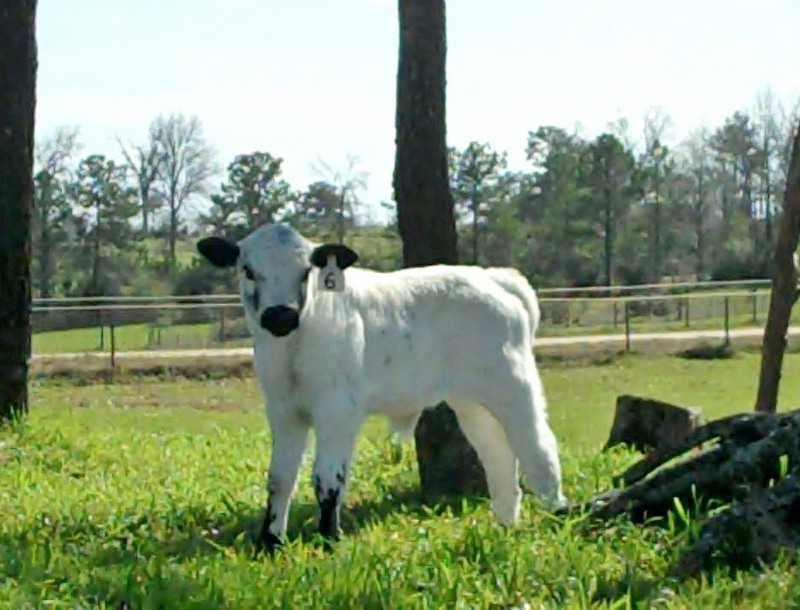 The fact is most kids take a huge risk of their time, effort, and money to show a British White heifer or steer. So far as I'm concerned, these kids who stubbornly stick to their guns with their Ag teachers and parents and 4H advisers who vehemently counsel them NOT to choose a British White -- those kids ought to get an award of financial help from the BWCAA, not just a breed champion winner. These kids are WINNERS simply by virtue of stepping out of the box and showing a British White animal! Grant is just such a winner. 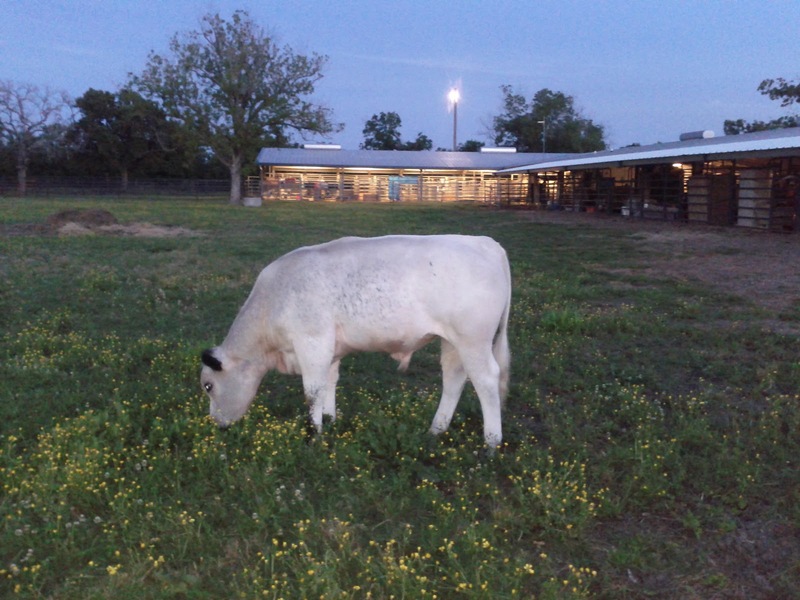 Grant took a grassfed steer out of the pasture and turned him in to a beautiful shining example of the breed. Titus had been long since weaned, probably a good four months, and turned out to winter hay and alfalfa rations. His counterparts in this steer competition most likely all came from grain backgrounding programs aimed at pushing their growth before they were even off their dams, halter broken at a young age, and made available as show steer possibilities right from the jump. So that difference in background feeding was an enormous hurdle that Grant and Titus had to overcome and it was quite a challenge. As for halter breaking - Titus was awesome about that, and Grant was quite happy with the ease of working with him and by all accounts Titus just loved all that attention. 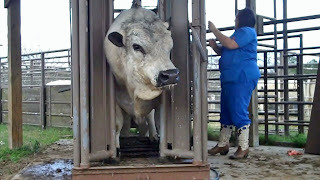 Titus was an American Fullblood sired by J.West's El Presidente and his dam was J.West's Brigit, a King Cole daughter. While Titus did not place, the judge couldn't find a criticism to make of him that I could hear - except to say he would be a top contender in the group if he had had 60 more days of finish on him. The judge did not even acknowledge that Titus was a British White! Perhaps he did not know. Hmmm....... Is that lack of breed awareness or respect my and my fellow small breeders' responsibility or fault? Or is it the Association's lack of support in promoting our breed to the mainstream cattle industry? 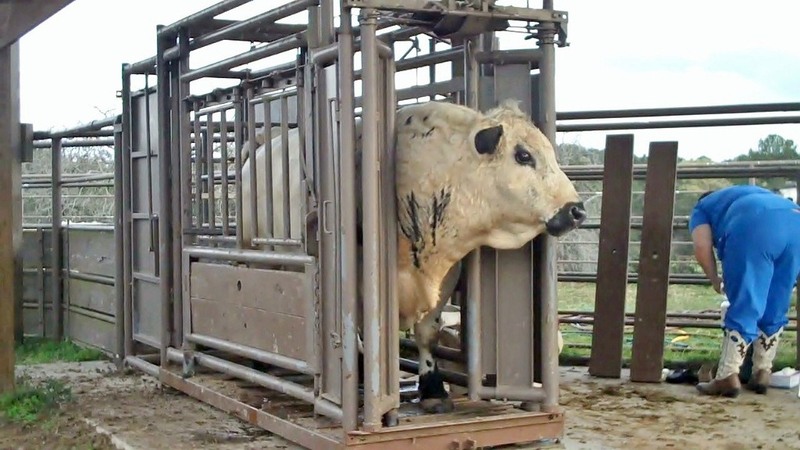 If they don't find the cattle worth the monetary risk of supporting and promoting them - who will? So far as I know there are no wealthy individual members who can hire a marketing firm for promotion and education or single-handedly orchestrate a steer test or British White show and sale for the benefit of all members and the breed. 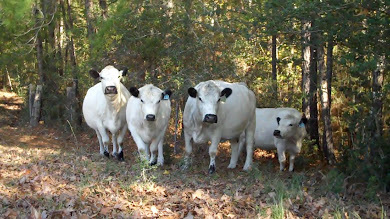 And for certain, we small breeders can yak all day long about how awesome we find our British White cattle, put up nice web sites, take good photos, give away meat from our freezers, even practically give away bulls to get someone to try the breed - but that doesn't cut it in the long run because it is not data - real data - on the merits of the breed - and cattle are business - and successful businesses operate on supportable facts - not the fairy dust of words or opinions. Below is a video of Grant and Titus' big day at the fair. This was Grant's first effort at raising and showing a steer. He learned a great deal in the process, and I did as well, as he kept me abreast of the feeding regimen and weight gain as things progressed, as well as shared lots of amusing stories of Titus' good-natured antics. 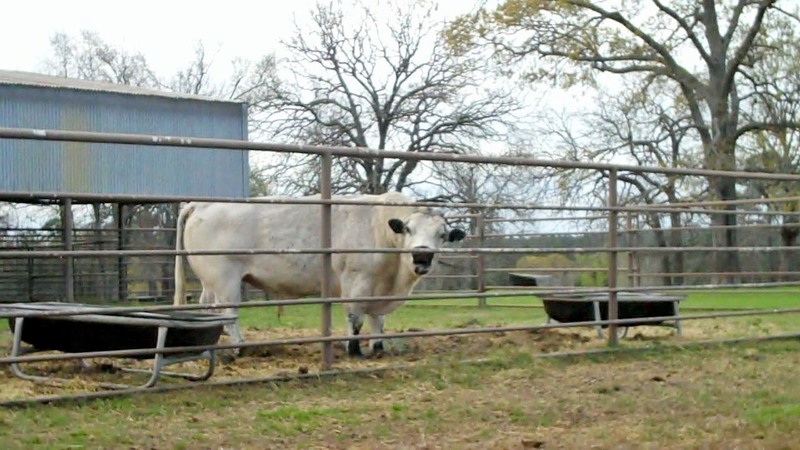 I was very proud of him and his steer. Grant didn't get Titus until late in the game, and that no doubt contributed to the lack of finish the judge observed, and I didn't help any by trying to get Titus transitioned to grain from grass a bit too fast. That was a disaster to say the least, and Titus looked woefully thin and not at all a show contender. Despite how pathetic Titus looked when Grant picked him up, I think he and I both hung on to the picture of him in our minds of how he was just weeks before and what he could be. Youngsters like Grant with a strong passion for the breed who resolve to show them against all odds and advice are the future of this breed - and each one should be applauded and awarded for their efforts. And no doubt devoted Mom's like Grant's mother, Darlene, would certainly appreciate the acknowledgement of the very special grit and determination of their kids who insist on showing a British White. If the BWCAA can afford to waste about $2K on a useless and wholly unnecessary compilation and review (there is no such thing as a "review audit") and now another $2K? 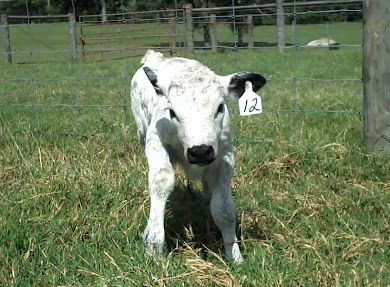 on officer's liability insurance each year - then surely our BWCAA member fees can be allocated a bit more generously to these FEW youngsters across the USA who stubbornly take on the world to show their British White steers and heifers. 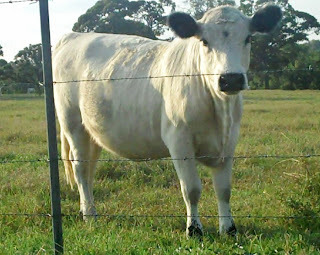 I have created lots of British White items on Cafepress.com with cow photos, particularly my old Wanda Mae, an outstanding British White cow. Below are a few examples of the items available, and I hope to have more in the future, so be sure and check back! Make plans to attend the annual meeting of the BWCAA on June 8th and 9th in Snyder, Texas. Members and non-members alike are welcome to attend, and it is a great opportunity to learn more about the breed and meet breeders from around the country. The BWCAA meeting events will be held at the Coliseum Ag Annex in Snyder. The Western Swing Festival will be in full swing in Snyder that weekend as well, with lots of live entertainment and good food to enjoy. For more information on the Festival visit http://www.SnyderChamber.org . I'm hoping some rain will 'swing' our way while we are attending the Snyder meeting. We're dry as a bone and the flooding rains of spring seem like a dream. To remind me it was real, here is a video of the terminally low pond on our place. It was brim full in April, the floating dock was actually floating for the first time in years. Fortunately, it is still floating, but the pond level has dropped . . . . quite a few feet already. Cattle Are Sentient Creatures - And I wouldn't have it any other way . . . 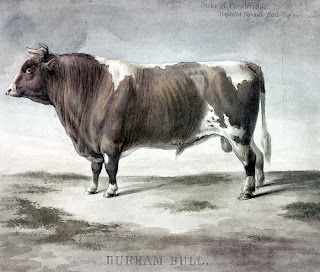 There are times in this cow business when I find myself considering, fleetingly, becoming a vegetarian; when I keenly understand why some folks are so adamantly anti-meat. Some particular event happens that makes me think a little deeper about the 'feelings' of my cows, or at least some of them. I then mull over in my mind many of the fairly ridiculous stances of a lot of the extremist PETA types, most of whom no doubt have never stepped in cow manure or certainly never resuscitated a newborn calf -- but yet are emphatic that cows are 'sentient' creatures and therefore shouldn't be eaten. Which leaves them in a sorry life in a zoo in some perfect future vegan world with zero meat consumption. Wait . . . That's also the FAO arm of the United Nations' long term plan! But I'm not going there this morning, discussing the FAO right now would give me a headache and make me nauseous, and my health care has already gone up 40% in the last two years, so I have to be careful not to go to the doctor, that might be an excuse to raise my rates another 20% next year. Oops, digressing . . . I recently sent Elsie Edna and Clementine on to their new home in Oklahoma. These two heifers are really bonded, more often than not found together, and I think would really have been traumatized to have been shipped off to separate pastures. Eventually that strong tie they have now won't be so important, but at 2 years old the bond is still very strong. Clearly, these two demonstrate that cattle are indeed 'sentient' creatures, as they have 'feelings' toward one another. 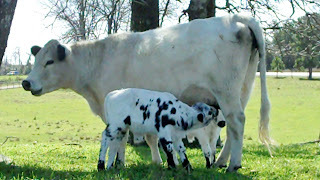 I 'had' two other heifers who were very much pasture buddies, born 7 days apart - J.West's Boopsie and J.West's Lassie. Unfortunately, I never took a photo of the two of them together, but I do have a 'picture memory' of the two of them from last Sunday. They both walked up to the cattle guard by the house, checked it out, looked at me, and presumably listened to me (okay probably not) when I told them not to walk that cattle guard. But, they did promptly turn around and prance off together . . . and that's the last time I saw them alive and well. Sunday night we were hit by the worst of thunderstorms and the lightning was very bad. Boopsie and Lassie died under a grove of hickory trees, lying about a foot apart. Fortunately, the rest of the cattle in that group were all fine, and so was every other pasture group. I had moved this group in to the pasture by the house on Sunday so they could get shelter under the barn's big tractor shed, which they generally immediately do when the rain gets hard. For some unknown reason they didn't this time. The ground outside the shed was smooth and slicked off from the massive flow of water run-off from the barn roof (we had probably 11 inches or more of rain), so clearly the cows didn't exit the shed after the storm, they simply weren't there. Boopsie was Carter sired out of a Popeye daughter, bw 66 lbs. Could it be something wasn't safe that night about the shed? Oddly, when we finally got power back on Monday, all the power to the barns was still out, and that's never happened before. 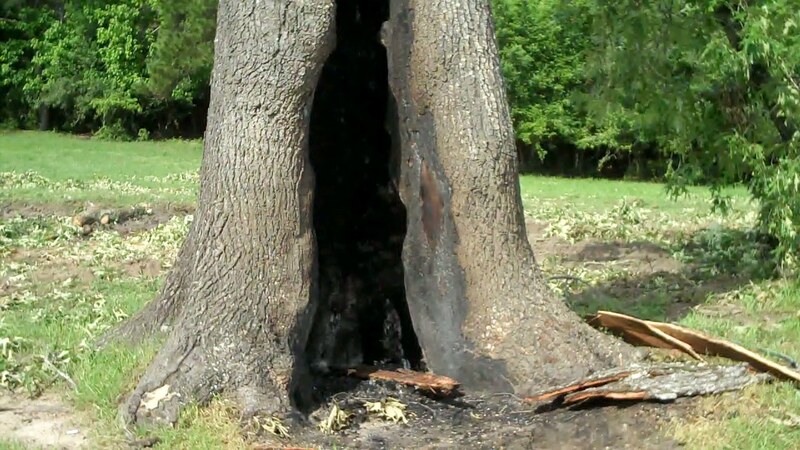 Something caused the main breaker to all the barns to trip, and I have to wonder if it was a lightning strike directly to the barns or a hit to the ground around the barns. They are metal pole barns, with tin roofs and walls of course, and I've not ever considered the possible danger to the cattle from being under a metal structure during severe lightning. So far we haven't found a thing to indicate a strike on or around the barns, so it will remain a mystery. Lassie was Carter sired with a bw of 37 lbs. 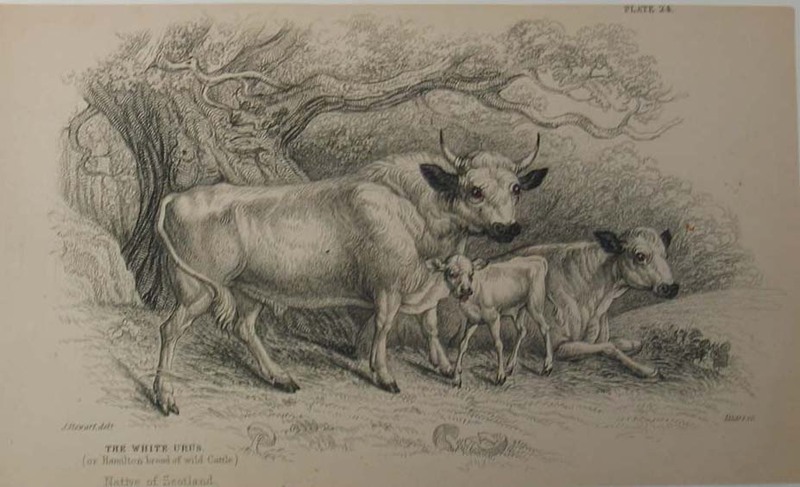 The sight of those two heifers lying dead and bloated under the hickory grove was a shocking sight. 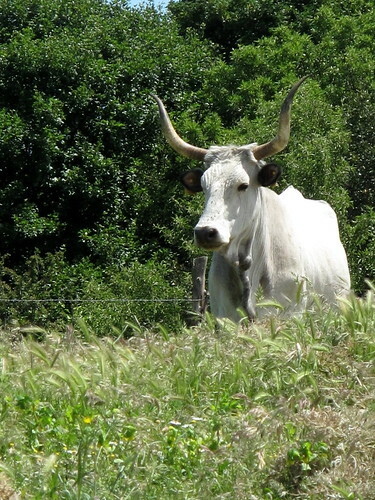 Their walk to the cattle guard, their quizzical looks at me and down at the rails of the cattle guard, and that quite prancing turn and exit off to the pasture was all I could see in my mind, the contrast startling, the end of that life lying in the mud. Rational or not, this became one of those moments when I question what I do, and think of the 'sentient' creature argument of vegans against eating meat. But, even so, as the days have passed and I've thought about my own personal reaction to the loss of the heifers, I suspect it is me being too sentient of a human creature about my cows, or at least about some of them. 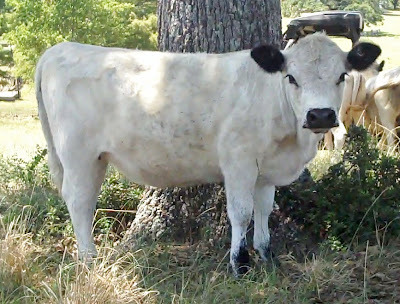 Yes, I do think cattle are 'sentient' creatures, many seem to make eye contact with us humans with something ticking in their brains and coming through their eyes that makes a total lie of the 'dumb cow' phrase for sure, could be their eyes are just so pretty I imagine it though. Look at little Lassie pictured below - she had the sweetest eyes ever. 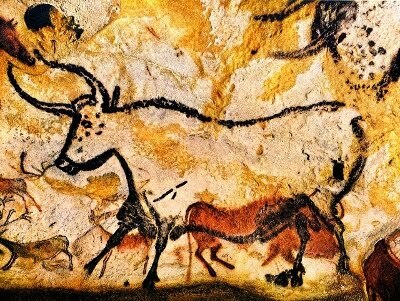 But sentient creatures or not, beef has been critical to the human diet since time out of mind. 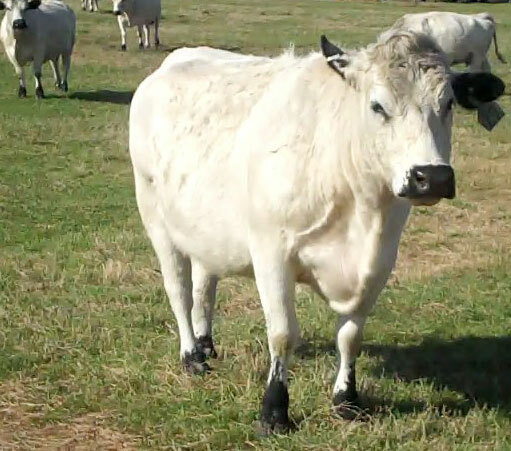 So, I'll not be tossing out all the grassfed beef in the freezers, or turning the ranch in to a petting zoo, and for sure I also won't stop caring about the well being of my cows and trying to tune in to what they need in a 'sentient' way. I'm glad I had that odd last encounter with Boopsie and Lassie; you have to wonder, or at least I have to wonder, about the timing of that and their death mere hours later. I couldn't tell you one thing about any other cow or calf in that group from the afternoon before - just that picture memory in my brain of Boopsie and Lassie . . . Yes, cattle are quite the sentient creatures, but I wouldn't have it any other way. 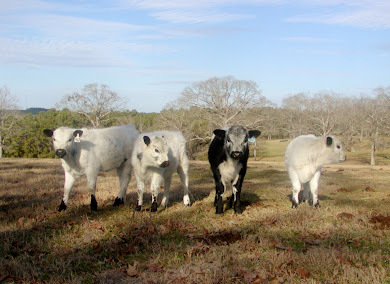 Happy Easter from J.West Cattle Company . . . and Happy Spring and Happy Ostera! How fortunate we are that this most ancient and most revered celebration in the Christian world is still allowed to be celebrated publicly in the United States of America. It actually strikes me as quite odd that it is still politically correct and unoffensive to say 'Happy Easter'. I really can't imagine why we aren't already forced to say 'Happy Spring' - particularly in our public schools. Perhaps the day is coming when we see politically unoffensive pagan festivals of the ancient gods and goddesses beneath a peaceful spreading oak tree in a farmer's cow pasture, or beside the banks of a clear and beautifully flowing stream deep in the woods - all with a closely guarded secret of course - that it's a scam of the Highest Order - if you get my meaning? The mainstream media would have a field day with that - probably run massive news coverage with the headline: Proof The United States is not a Christian Nation! or, Paganism Replacing the Pulpit! Christian city dwellers could even camp out in the public parks for some pagan tree praying! Hmmm, what would the media label them? Occupiers! Occupying for their right to worship nature . . . what conceivable argument could be found with that? They would be hailed as 21st Century hippies who actually cleaned up their trash, and would likely be interviewed with fond tolerance on the Today Show or Good Morning America. Below you'll find some really old sayings and superstitions about Easter that are amusing, but also informative. I had no idea that getting my 'Easter dress' as a child was from traditions started hundreds of years ago; and certainly had no idea how far back the tradition of the Easter egg dates. If I'd been asked that question, I'd probably have replied without much thought that it is likely something Americans got started - I've just never really thought about it. Shame on me. Also, I've excerpted at the end a great deal from an 1859 printing of a 'Cyclopedia' on the topic of Easter. I haven't stopped to check what a modern 'Encyclopedia' says about Easter, I just generally like to read the less politically edited versions of old topics. "A good deal of rain on Easter Day Gives a crop of good grass, but little good hay." of Newborn Kittens to Back that up - Need a Kitty Kat? "The custom of the Christians to present Easter-eggs as a symbol of the resurrection, has been adopted from the peoples of the East, particularly the Persians, where the egg was since the most ancient times symbolical of creation, or the re-creation of Spring. In Christian countries the Easter-eggs were painted red in allusion to the blood of the Redeemer. The usage of interchanging eggs at Easter has also been referred for its origin to the egg games of the Romans which they celebrated at the time of our Easter, when they ran races in an egg-shaped ring, and the victor received eggs as a prize. These games were instituted in honor of Castor and Pollux who came forth from an egg, deposited by Leda, after Jupiter had visited her in the shape of a swan. Others allege that the custom was borrowed from the Hebrews who at the passover set on the table two unleavened cakes and two pieces of lamb. To this they added some small fishes because of the leviathan, a hard egg because of the bird Zig, and some meal because of the behemoth. 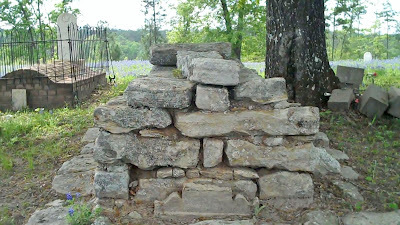 In some remote districts of France it is still customary for the priest of the parish to go around to each house at Easter and bestow on it his blessing. In return he received eggs, plain and painted. In Italy an egg dyed scarlet like the cloak of a Roman Cardinal is carried by some for luck all the year round. It is very unlucky to give away a colored egg that has been presented to you at Easter." "EASTER, the festival of the resurrection of our Lord, or the Christian passover. The English name Easter and the German Oitern have been supposed by some writers to be derived from the name of the feast of the Teutonic goddess Ostera (the goddess of spring), which was celebrated by the ancient Saxons in the spring, and for which the early missionaries substituted the Christian festival. According to Adelung, both the English and the German words are derived from the old Saxon word otter, oaten, which signifies rising, because nature arises anew in the spring. According to the Mosaic law, the passover among the Jews was celebrated on the 14th day of the month Abib, afterward called Nisan, that is, within a day or two before or after the vernal equinox. The early Christians differed in regard to the time of celebrating Easter. The churches in the West, taught, as they declared, by St. Philip and St. Paul, observed the nearest Sunday to the full moon of Nisan, without taking account of the day on which the passover was celebrated. The Asiatic churches, on the other hand, in accordance as they said with the tradition derived from St. John, followed the Jewish calendar, and adopting the 14th of Nisan as the day of the crucifixion, celebrated the festival of Easter on the 3rd day following, whatever day of the week that might be. Saving occasional disputes, matters continued in this state until the time of Constantino, who had the subject brought before the council of Nice (A. D. 325). The question was fully discussed, and finally settled for the whole church by adopting the rule which makes Easter day to be always the first Sunday after the full moon which happens upon or next after March 21; and if the full moon happen on a Sunday, Easter day is the Sunday after. By this arrangement Easter may come as early as March 22, or as late as April 25.—This sacred festival has been termed the queen of festivals; it has been observed from the very beginning, and it is celebrated in every part of the Christian world with great solemnity and devotion. The primitive Christians very early on the morning of Easter saluted each other with the words: " Christ is risen;" to which the response was made : " Christ is risen indeed, and hath appeared to Simon." The Greek church still retains this custom. In nearly all Christian countries the recurrence of Easter has been celebrated with various ceremonies, popular sports, and superstitions. Among the best known is the English custom of making presents of colored eggs, called pasche or paste eggs, which were often elaborately ornamented ; and in a royal roll of the time of Edward I., preserved in the tower, appears an entry of 18d. for 400 eggs to be used for this purpose. Colored eggs were used by children at Easter in a sort of game which consists in testing the strength of the egg shells, and this practice is retained in many places in England and the United States. 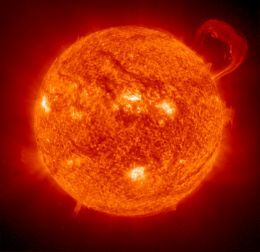 In some parts of Ireland the legend is current that the sun dances in the sky on Easter Sunday morning. 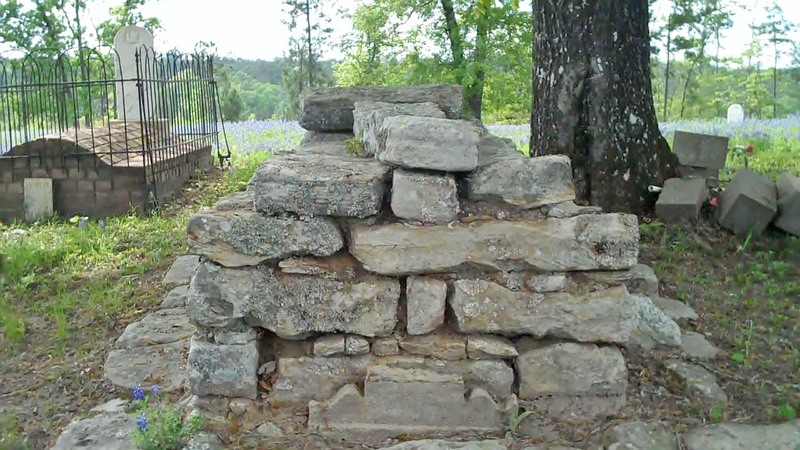 This was once a prevailing superstition in England also, which Sir Thomas Browne, the author of "Inquiry into Vulgar Errors," thought it not superfluous to declare unfounded." For lots of old traditions and superstitions surrounding Easter and other events see: Encyclopedia of Superstitions, Pg. 1515. The following is a full reprint of a Noble Foundation article published in September of 2008. It certainly is pertinent to today's cattle business environment, I'd say even more so today than in the fall of 2008 -- and without a doubt the livestock industry is " . . . about as interesting as most of us can stand." Cattlemen following the advice of Mr. Wells back in 2008, would have weathered the past year and more of Texas drought with less hardship to their bank account and their cattle herd. "There is an old Chinese curse that says, "May you live in interesting times." The current era in the livestock industry is about as interesting as most of us can stand. I believe we are in the midst of a paradigm shift. 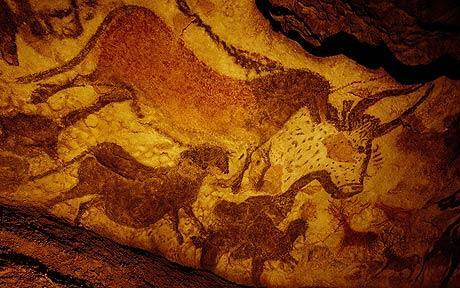 The cattle industry of tomorrow will almost certainly look different than it has in recent years. 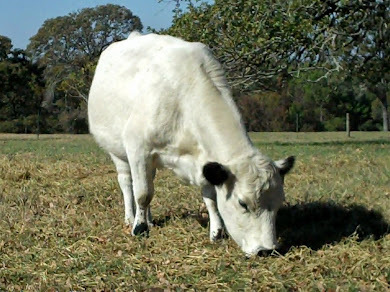 During 2008, many ranchers did not apply the same amount of fertilizer as they have in the past. Thus, in combination with low rainfall, forage quality and quantity this fall and winter may be lower than in the past. 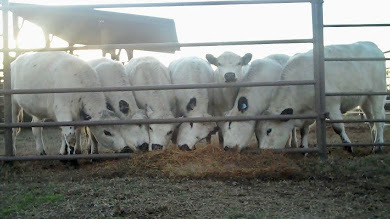 The price of feed has increased by 20-25 percent compared to fall 2007; therefore, feeding the current herd size though the winter may not be economically justifiable. So what can a rancher do to stay economically viable given the high input costs? 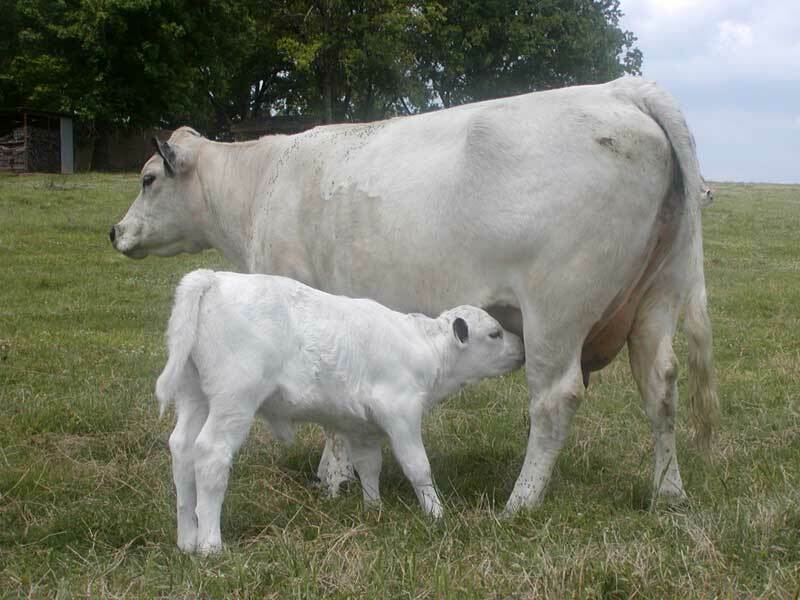 Ranchers need to look at several aspects of their cow herd: mature cow size, milking ability of the cow and stocking rate. 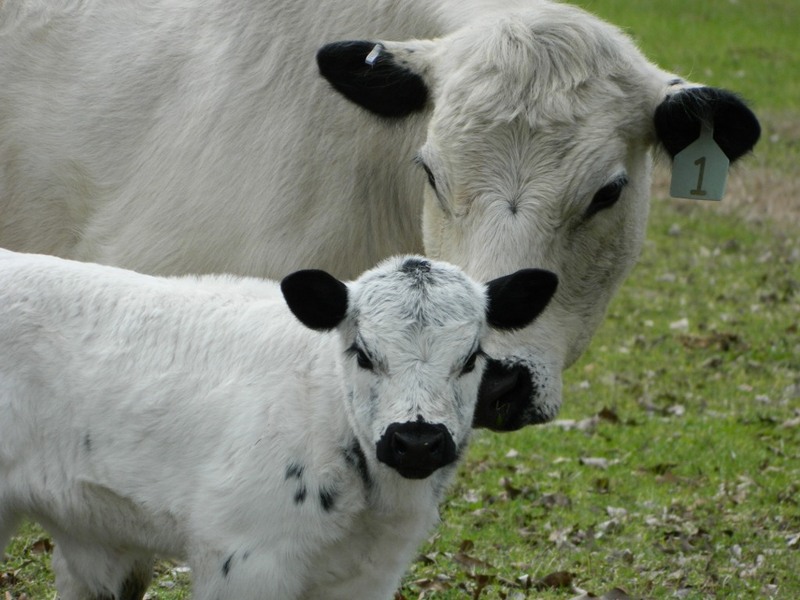 There have been many articles written to advise ranchers that they may need to moderate the mature size of their cow herd. 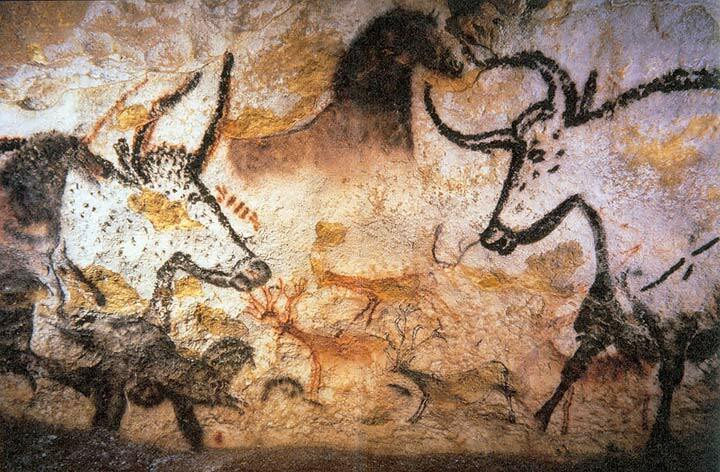 We should always match the cow with the environment and the bull with the market. 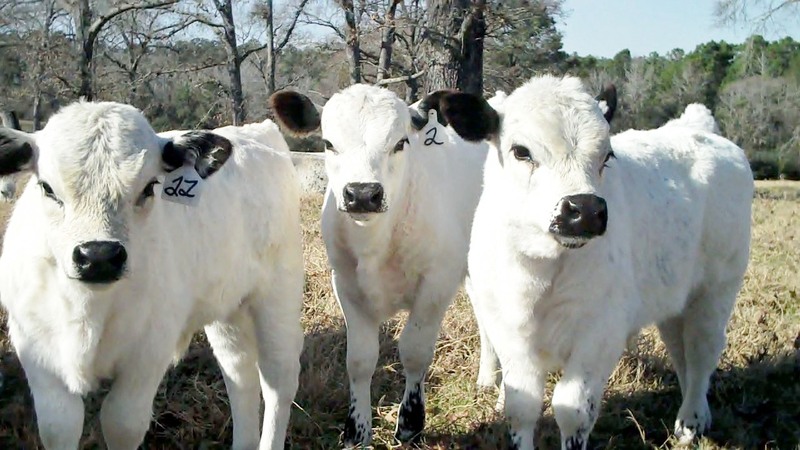 If you are in western Oklahoma or the Texas Panhandle, the optimum cow for your operation will typically be smaller than a cow on a ranch in the southeastern U.S. 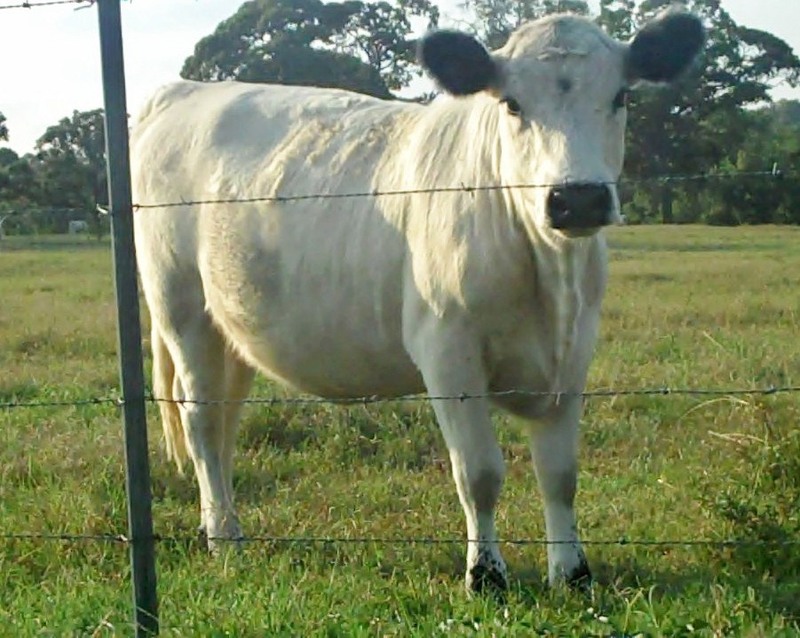 If your stocking rate (without fertilizer) is in the double digits of acres per animal unit, you might consider using a moderate-framed (smaller) cow (i.e., less than 1,000-1,100 pounds). Using a calving-ease, terminal-cross, and performance breed bull could yield calves that will be 50-60 percent of the cow's weight at weaning. If you have a moderate-framed cow, but she is a heavy milker, then her requirements are higher than those of a low or moderate milking cow. 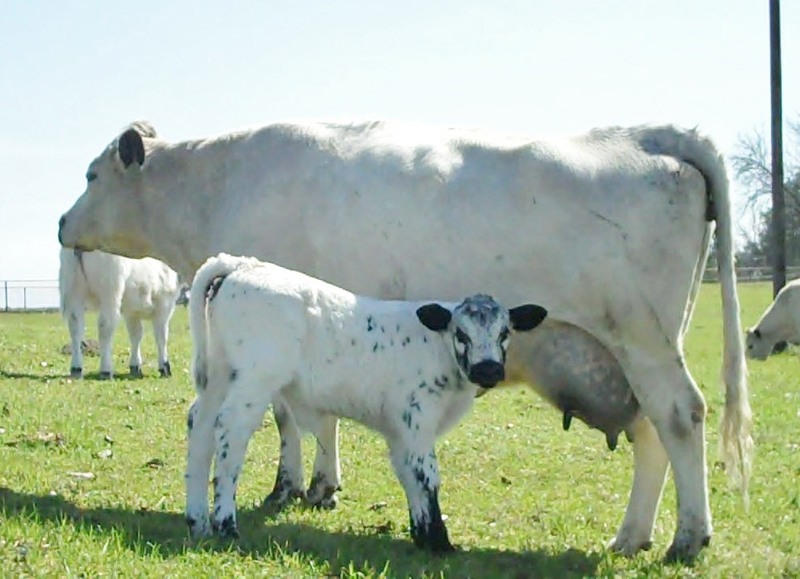 Granted, a heavier milking cow may wean a heavier calf, but if you have to supplement that cow to a greater extent for her to recover flesh before the next calving season, are you really making more money? A heavier milking cow has a higher maintenance requirement even when she is not lactating. 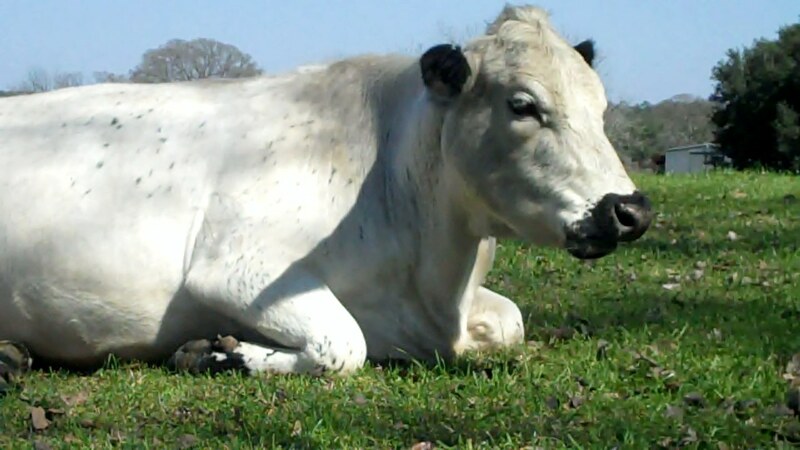 Thus, she requires more forage and feed to maintain her body condition score. Stocking rates will have to be adjusted if you have changed fertilizer rates from previous years. This reduction should take place in September before the flood of open and old cows goes to market in the fall. 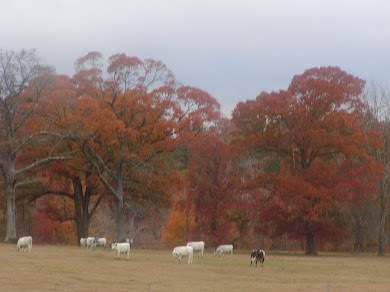 October and November are typically some of the lowest priced months to sell a cow. With the high cost of feed, it will be difficult to economically support feeding all the cows if the herd is at a maximum stocking rate. Many producers will get to the first frost and then realize that they will be short on pasture and hay this year. 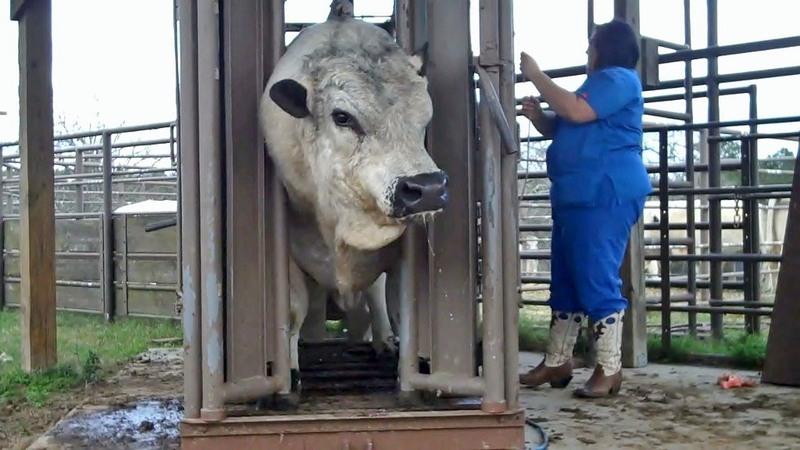 We need to get out of the mindset that a particular ranch needs to have a specific number of head to support itself. If your current number of head requires a lot of inputs, the ranch may be more economical at a lower number of cattle with fewer inputs. As input costs continue to increase, we may need to look back to our grandparents' era to see how cattle were raised before we had easy access to fuel, feed and fertilizer. With every change in the industry, new opportunities abound. Those who dare to venture out of their comfort zone are those who will stay in the business for years to come. By becoming more efficient today, you will have a better chance of weathering the storm." 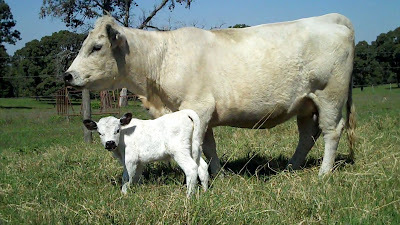 © 1997-2012 by The Samuel Roberts Noble Foundation, Inc.
Last week I said I'd take a look at the color of my new calves out of Target on this week's blog. Trying to reason out the why's of color is sort of an excercise in futility! That said, as calving has progressed this past week, there really hasn't been a lot of surprises like I anticipated after the first few calves were born. Target most definitely likes to make bulls, so far I've had only one Target sired heifer born, so there'll be lots of grassfed beef for sale here in the Spring of 2014! Here's a look at some of them . 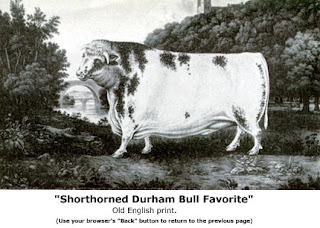 . .
Target is a mostly blue-skinned bull sired by El Presidente, also blue-skinned, out of dam, J.West's Morgan, who has light speckling on her sides; and his granddam, Halliburton Marie, a Popeye daughter, had light speckling as well, practically identical to her daughter, Morgan. This is a first calf heifer sired by Carter, J.West's Molly, whose own dam, Doc's Gal, and granddam Ms. Rae, and great grandam, CRAE 215G are all standard marked. I was quite surprised to see this little guy present himself with these large splashes of black. 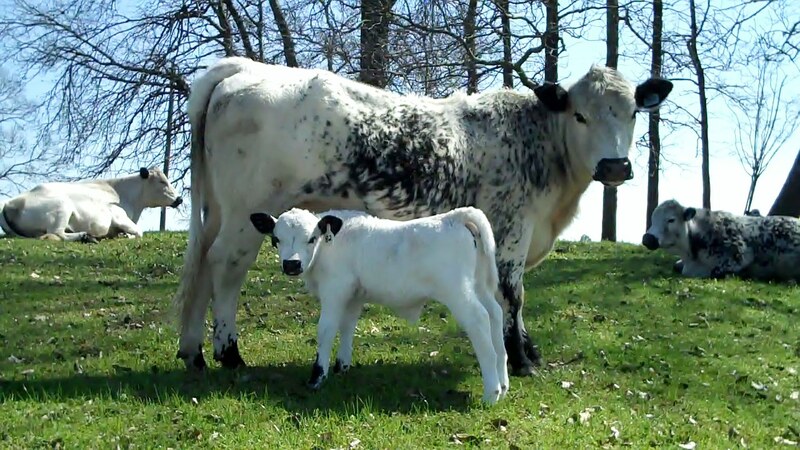 This is a first calf heifer sired by Carter, J.West's Miss Marie, whose own dam, Merry Marie, is marked almost identical to her in color pattern. Her grandam is also Halliburton Marie, pictured above, so she's a 2nd cousin to Target, and if any one of these three calves could have been expected to be speckled or spotted, it would be this calf. This is Maude Rae, a daughter of Huckleberry Finn and CRae 215G, and an aunt to Molly above. 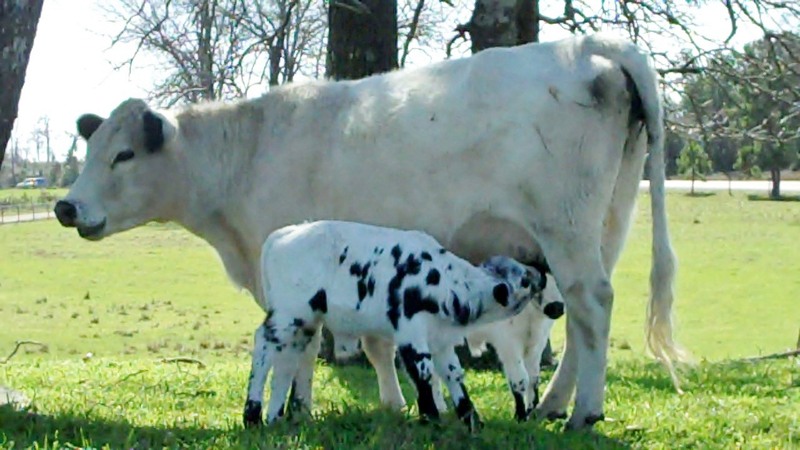 As Huck Finn has lots of spots, I might have expected her to have a very spotted calf out of Target if Molly did. Not so, but he does have lots of black about the face, more than I generally see in my calves. This is Brigit, a daughter of King Cole, who was a blue-skinned bull with speckling; and Brigit herself is quite blue skinned and lightly speckled, having very nice pigment in all the vunerable areas. Her dam and grandam both have mostly identical markings, with distinctive neck and shoulder spotting. Brigit's dam and maternal sister are pictured below. This Target sired calf is very much like his dam, Brigit, but with some black about the face.